The Emory women’s tennis team left disappointed after yielding several key points in a 7-2 match against Georgia Gwinnett College on April 17. Although the Eagles lost the match, it was still memorable for the team as it marked Head Coach Amy Bryant’s (96B) 20th season at Emory. In doubles, freshman Christina Watson and sophomore Stephanie Taylor faced little resistance from their opponent. With several aces from Watson, the duo secured an 8-3 victory. Freshman Jessica Fatemi and senior Daniela Lopez, on the other hand, fiercely battled their opponents. Both sides had strong serving games, but the Eagles lost the close match in the tiebreaker, 8-7. Sophomores Ysabel Gonzalez-Rico and Defne Olcay got in their own way, sailing the ball out of bounds several times and losing 8-2. The Eagles played several other close matches in singles, and half of the matches ended in a tiebreaker. Gonzalez-Rico could not find her groove and yielded the match to her opponent, 6-0, 6-3. Lopez won her first set, but her opponent increased the pressure in the ensuing sets. She lost 3-6, 6-2, 6-2. Olcay fought relentlessly but lost the match, 7-5, 6-4. Freshman Emma Cartledge had a close match against her opponent, and their battle lasted longer than any other match. She won the first set and tried to keep up her momentum but lost in the match tiebreaker, 6-7, 7-6, 10-6. Freshman Lauren Yoon also yielded her match, 6-2, 7-6. Fatemi brought back the only singles victory. After badly losing the first set, she quickly bounced back and won the match 1-6, 6-3, 6-0. With their regular season now over, the Eagles celebrated Bryant’s 20th anniversary at Emory. She assumed the head coach position back in 2000. In her 20 years as a coach and four years as a player at Emory, she has been one of the most successful figures in the program’s history. Bryant was the first women’s tennis player in Emory’s history to earn All-America honors in both singles and doubles. She was the runner-up in the NCAA national singles championship her junior season in 1994-95 and teamed up to reach the semifinals of the NCAA doubles championship her senior year. Besides being a successful player herself, Bryant has led the Eagles to achieve numerous honors and awards as coach. Over the past 20 years, the Eagles have won national titles in 2003, 2004, 2005, 2006, 2014 and 2016. The team has recorded a 396-98 overall record with 18 appearances in the NCAA national quarterfinals and 12 appearances in the NCAA team championship finals. Bryant has coached five players to NCAA Division III Singles Championships and a doubles pairing to four consecutive NCAA national titles between 2001 and 2004. Under Bryant, players have won 87 All-America awards and 12 conference Most Valuable Player honors. Reflecting on her career at Emory, Bryant talked about what makes her decide to coach the Eagles persistently. Celebrating Bryant’s 20th season at Emory, the Eagles along with former players made a video clip recording their best wishes. Team captain Lopez has been a part of Bryant’s team for four years, and she expressed her gratitude toward Bryant. The Eagles will fly to Florida to compete in the UAA Championships from April 25-27. On April 15 and 16, the No. 3-ranked NCAA Division III Emory men’s tennis team defeated the No. 19 Sewanee: The University of the South (Tenn.) Tigers 7-2 and Washington and Lee University 8-1 to earn their ninth and 10th consecutive team victories, pushing their season record to 14-2. In doubles, the top team of seniors Jonathan Jemison and Adrien Bouchet improved their season record to 20-4 after narrowly upending the Tigers’ first doubles team of Aubrey Davis and Jordan Brewer, 8-6. In third doubles, freshman Antonio Mora and sophomore Alec Rabinowitz also defeated their opponents, Ryan Wax and Brandon Kali, 8-2. This gave the Eagles a 2-1 lead heading into the singles portion of the match. In singles, the Eagles dominated by winning five of six matches. Bouchet played against the Tigers No. 1 Andres Carro and triumphed with a 6-3, 6-3 win to boost his season record to 16-3. Mora followed Bouchet’s victory with a win of his own in second singles over Jack Gray, 6-1, 6-3, for his 16th victory in 19 matches this season. In third singles, freshman Andrew Esses earned a 7-5, 6-1 verdict against Brewer. The Eagles also earned victories at the fifth and sixth singles spots to cap off a successful day. 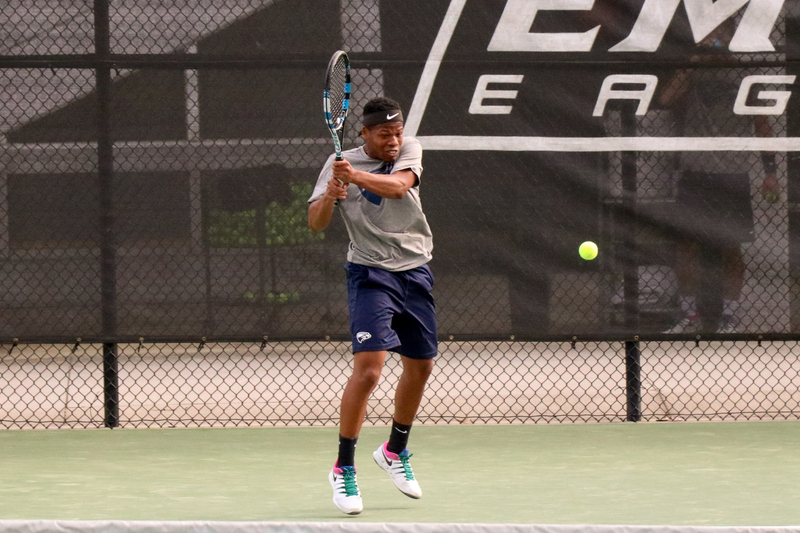 In Emory’s final regular-season home match on April 16, the Eagles cruised past Washington and Lee University (Va.) by a score of 8-1 to improve their collective team record to 14-2. In doubles, the Eagles won 2-1 and they swept the singles section of their matchup. All four seniors, Jemison, James Spaulding, Bouchet and George Congdon, won their last regular season singles matches handedly, while Mora and Esses also contributed to the team win with victories of their own. After their match against Washington and Lee, Esses said the team is looking forward to postseason play. The Eagles return to action for the quarterfinal round of the University Athletic Association Championships in Orlando, Fla. on Friday, April 26. This past weekend, the No. 1-ranked NCAA Division III Emory women’s tennis team played two matches against Division I Georgia State University and No. 6-ranked Division II Columbus State University (CSU) (Ga.). On April 13, the Eagles suffered a bitter 4-3 loss to Georgia State, but bounced back to beat CSU on April 15, 4-3. Assistant Coach Barbora Krtickova thought facing opponents from other divisions offered positive experience for the team, despite the split results. During the match against Georgia State, Sophomores Ysabel Gonzalez-Rico and Defne Olcay opened up doubles with a 6-2 victory. On the second court, freshman Emma Cartledge and senior Daniela Lopez lost to their opponent, 6-4. Sophomore Stephanie Taylor and freshman Christina Watson fought relentlessly against their D-I opponents to notch a 7-5 victory. After winning two out of the three matches, the Eagles earned the doubles point, according to the Division I rules. In singles, the Eagles won two matches but lost four. After dropping the first set, Gonzalez-Rico overcame some tough moments and finished the match with a 3-6, 6-3, 6-4 victory. Cartledge also lost in her first set, but not one to give up, she continued to fight hard and won the match, 1-6, 6-4, 6-2. Lopez lost in two straight sets, 6-4, 6-1. Olcay played with great energy but lost to her opponent, 6-2, 6-2. Freshman Lauren Yoon was also outperformed by her opponent, 6-0, 6-2. Freshman Jessica Fatemi, after losing the first set, attempted a comeback but unfortunately lost in the last set, 6-1, 4-6, 6-3. Lopez believed they could improve on some details, especially their techniques. After suffering their second loss in the spring season, the Eagles did not get discouraged but proved their standing as one of the best teams in the nation with an excellent performance against Columbus State. The Eagles earned the doubles point by winning two matches in second and third doubles. Facing strong opponents, Lopez and Fatemi earned the 7-6 (7-2) win. Watson and Taylor emerged as the winners, 6-4, while Gonzalez-Rico and Olcay had some good volleys but dropped the set, 4-6. The Eagles carried their momentum into the singles matches. Thanks to several double faults made by her opponent, Lopez collected an easy victory in two straight sets, 6-3, 6-1. Fatemi swept her opponent, 6-1, 6-3. Gonzalez-Rico faced some difficulties against CSU’s Marleen Tilgner. Gonzalez-Rico kept hitting wide angles, but Tilgner responded with strong defense. After dropping the first set, Gonzalez-Rico was able to come out on top and earn a 4-6, 6-3, 6-4 victory for her remarkable twelfth, consecutive match win. On the other hand, Olcay had a hard time, losing her match in two sets, 0-6, 4-6. Cartledge and Yoon both lost to their opponents, 3-6, 3-6. Despite the losses, the Eagles carried the day against their D-II opponent. The Eagles will return to action April 17 against Georgia Gwinnett College. In a matchup last weekend between two talented NCAA Division III teams, the No. 2-ranked Emory men’s tennis team travelled to face off against No. 3-ranked Middlebury College (Vt.). The Eagles defeated the Panthers 6-3 for their eighth straight victory and arguably their most impressive win of the season. In singles play, Emory and Middlebury split the matches, winning three each. Senior James Spaulding notched one of these wins with a score of 6-2, 6-3. The other two wins came from freshmen Antonio Mora and Andrew Esses, who secured a 7-6 (7-0), 6-2 win and a 5-7, 6-3, 10-2 win, respectively. Emory shined in doubles play as they triumphed in all three matches. The veteran team of seniors Jonathan Jemison and Adrien Bouchet defeated their opponents 8-6. Sophomore Will Wanner and Spaulding also prevailed with an 8-3 win, the duo’s 8th straight victory. In addition, Spaulding was selected as the University Athletic Association’s Men’s Tennis Player of the Week for his outstanding play. Sophomore Hayden Cassone and Mora completed the doubles sweep with a score of 8-7 (7-5). While Head Coach John Browning was happy about the victory, he is more focused on the team’s improvement than the win-loss column. Sophomore Sahil Raina emphasized the importance of enjoying the season and taking advantage of the time on the court. “We had the mentality of going out there and having fun and living in the moment and we got the job done,” Raina said. With the win, Emory improves to 12-2 on the season. The Eagles return to action on April 11 at Middle Georgia State University. The No. 3-ranked Emory men’s tennis team won all three home matches against Kalamazoo College (Mich.), DePauw University (Ind.) and Johns Hopkins University (Md.) this past weekend. The Eagles defeated Kalamazoo 8-1, blanked DePauw 9-0 and trounced Johns Hopkins 8-1 as part of their seven-game winning streak. The Eagles have not lost a match since February. This practice paid off against No. 27-ranked Kalamazoo, the first match of a three-game home stretch on March 28. In the doubles matches, seniors Jonathan Jemison and Adrien Bouchet blanked their opponents 8-0. Senior James Spaulding and sophomore Will Wanner earned an 8-3 victory, while sophomore Hayden Cassone and freshman Antonio Mora won 8-2. In singles competition, Jemison faced a tough opponent but played with great consistency, beating his opponent 6-4, 7-6. Bouchet secured a 6-2, 6-4 win, and Mora won the match 6-0, 6-2. Freshman Andrew Esses secured a victory with a 6-3, 6-2 score, and sophomore Sahil Raina swept his opponent in the second set to win 6-3, 6-0. Cassone fought relentlessly but ultimately lost in a close match, 7-6, 4-6, 10-8. On March 29, the Eagles notched another victory against DePauw. In doubles, Jemison and Bouchet won 8-3. Spaulding and Wanner recorded another win, scoring 8-5. On the third court, Mora and sophomore Alec Rabinowitz beat their opponents 8-1. The Eagles carried their brilliant performance into the singles matches, where Jemison dominated his opponent and achieved a spectacular 6-0, 6-0 victory. Bouchet continued to play at a high level and earned a 6-3, 6-1 victory. Mora also had a strong performance, as he defeated his opponent 6-4, 6-2. Esses played with unstoppable momentum, winning the match 6-4, 6-2. And senior George Congdon won easily by topping his opponent 6-0, 6-2. Wanner blanked his challenger 6-0, 6-0 to close out singles play. Browning praised the performance of his senior players. After just one day of rest, the Eagles returned to action on March 31, facing No. 25-ranked Johns Hopkins. Like before, the Eagles did not face too much challenge in doubles. The dominating tennis pair of Jemison and Bouchet acquired an 8-3 victory. Spaulding and Wanner continued their momentum and won the match 8-4, while Cassone and Mora won their match 8-3. In the singles match, Jemison played excellent volleys and even blanked his opponent in the second set to score 6-2, 6-0. Bouchet faced a harder challenge, but he successfully overcame every tough moment and scored key points several times in the game to win the match 7-6, 7-5. Mora’s strong return skills helped him earn another victory 6-2, 6-1. Esses He blanked his opponent in the first set by utilizing a variety of hitting styles and won the match 6-0, 6-3. Spaulding kept rendering pressure to his competitor and concluded the game with 6-1, 6-4 at court five. After losing the first set, Raina fought to catch up in the second set but missed the first few points in the match tie-break. Ultimately, his match ended in defeat 3-6, 6-1, 10-7. The Eagles will return to action against Middlebury College (Vt.) on April 7. 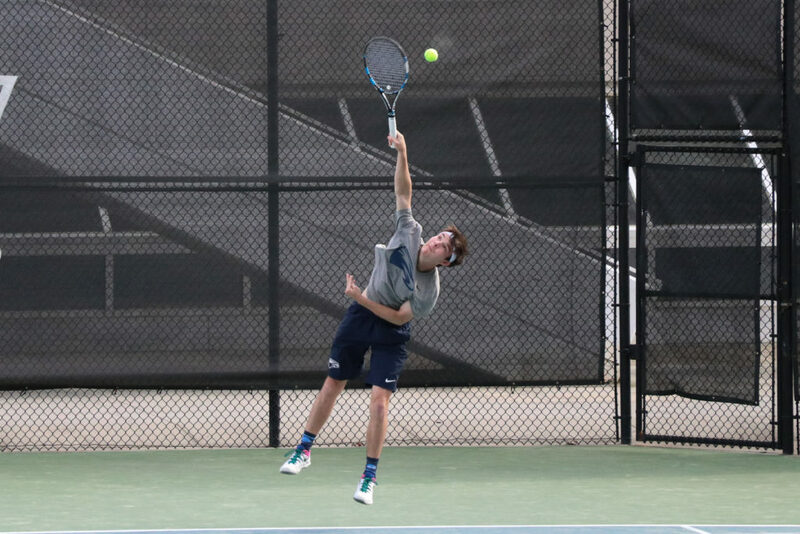 The Emory men’s tennis team had a successful two-match trip in Claremont, Calif. this past weekend, coming away with victories over the University of California (UC), Santa Cruz Banana Slugs on March 23 and the Williams College (Mass.) Ephs on March 24. The Eagles defeated UC Santa Cruz 7-2 and took down Williams 6-3, extending their winning streak to four. 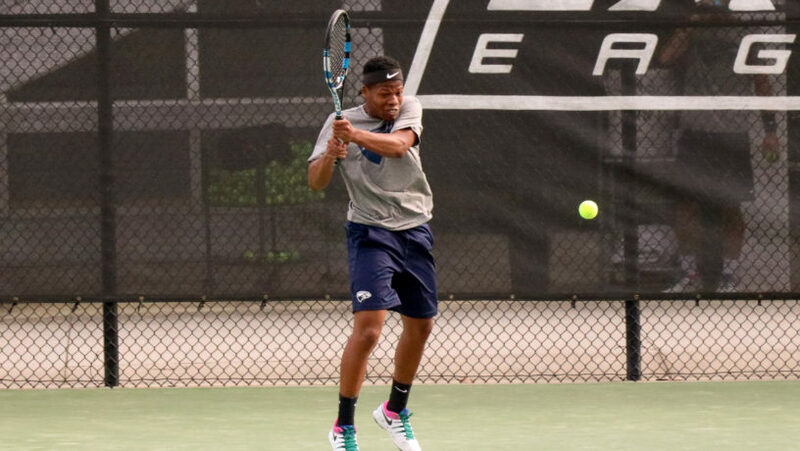 In addition, Emory senior Adrien Bouchet was named Men’s Tennis Athlete of the Week by the University Athletic Association. The Eagles dropped just one match in singles play, winning their remaining five matches in straight sets. Cassone took the unfortunate 7-6, 6-4 loss. Despite the doubles loss, Jemison and Bouchet each won their singles matches with identical scores of 6-3, 6-1, and Mora triumphed with a commanding 6-2, 6-0 victory. Freshman Andrew Esses and senior James Spaulding rounded out the victories with respective scores of 6-2, 6-2 and 6-1, 6-4. In doubles play, Emory went 2-1 against the Banana Slugs on Saturday. Sophomore Hayden Cassone and freshman Antonio Mora secured a dominant 8-2 victory, while senior James Spaulding along with sophomore Will Wanner squeezed out an 8-6 victory. Seniors Adrien Bouchet and Jonathan Jemison were defeated 8-7 in an extremely close match. Freshman Antonio Mora said he feels like the team did not get off to the best start this season but that they have worked incredibly hard to get back on track. On Sunday, Emory lived up to its No. 4 national ranking with a win over No. 5-ranked Williams. The Eagles came away with wins in four of the six singles matches, three of which went to a third set. Jemison rallied for a 5-7, 7-6, 6-1 win to improve his record to 15-2 this year. Cassone moved to 10-5 following his 6-3, 5-7, 6-1 victory and Esses battled back from a tough first set to defeat his opponent 2-6, 6-4, 6-0. Bouchet added the fourth singles win in straight sets, beating his opponent 6-3, 7-5. Spaulding and Mora each lost their matches with scores of 6-2, 6-2 and 6-3, 7-6, respectively. In doubles play, Emory went 2-1 once again. The No. 1 duo of Jemison and Bouchet earned an 8-6 win which raised the pair’s season ledger to 15-4. Spaulding and Wanner notched the other doubles victory with an 8-3 triumph, while Cassone and Mora were defeated 8-6 in their matchup. Head Coach John Browning said he believes the team is getting better with each match and that they have the ability to come away with another national championship this season. A championship run would earn the Eagles their fifth national title and their third in the last six years. The Eagles now sit at 8-2 on the season. Emory returns home for a match against Kalamazoo College (Mich.) on March 28. The top-ranked NCAA Division-III Emory women’s tennis team had a memorable spring break. The Eagles secured three victories against Carnegie Mellon University (Pa.), Amherst College (Mass.) and Wesleyan University (Conn.). On March 10, the Eagles traveled to Eastern Florida State College in Melbourne, Fla., where they gained an 8-1 victory against University Athletic Association (UAA) foe Carnegie Mellon. The Eagles began the match with a 2-1 doubles win: sophomore Ysabel Gonzalez-Rico and sophomore Defne Olcay earned an 8-7 victory. Sophomore Stephanie Taylor and freshman Christina Watson won six straight games and recorded an 8-2 victory. The Eagles won all of their singles matches. Gonzalez-Rico won 6-2, 6-3 in first singles. Senior Daniela Lopez secured a 6-3, 6-2 win and freshman Jessica Fatemi soundly defeated her opponent 6-1, 6-3. Facing strong opponents, freshman Lauren Yoon, freshman Emma Cartledge and Olcay all had strong performances and emerged victorious. Yoon rebounded after losing the first set 2-6 and won the second and third set 6-2, 10-5, respectively. Cartledge played tenaciously after yielding the first set and bounced back with a 4-6, 6-0, 10-7 victory. Olcay narrowly lost her first set in the tiebreaker 6-7, but she triumphed by topping her opponent with 6-0, 10-7 in the next two sets. Assistant Coach Barbora Krtickova praised the Eagles’ performance during a tough match against No. 11-ranked Carnegie Mellon. On March 14, the Eagles traveled to Rollins College (Fla.) for a match against No. 3-ranked Amherst, which Emory defeated with an 8-1 victory. The Eagles won all three doubles matches. In the first doubles matchup, Gonzalez-Rico and Olcay won 8-4. At the second doubles, Lopez and Cartledge won their 16th match by a score of 8-3. Lastly, Taylor and Watson won 8-2 and moved to 7-0 on the season. The Eagles continued their momentum during the singles matches. Gonzalez-Rico won her match as she blanked her opponent in the first set and won the match 6-0, 6-2. Lopez and Olcay both recorded their seventh consecutive singles win. After winning the first set and losing the second in a close tiebreaker, Lopez fought relentlessly in the third set and emerged as the winner with an astonishing 6-3, 6-7, 14-12 victory. Olcay won with 6-4, 6-2. Yoon earned the Eagles yet another singles victory 6-3, 7-5. On the last court, Fatemi fought hard in the tiebreaker of the first set and won her team-best 10th straight singles match, registering 7-6, 6-2. With no rest, the Eagles carried their excellent performances into the March 15 match against No. 7-ranked Wesleyan. The Eagles notched victories in seven of nine games, and the team took two of the three doubles matches. Gonzalez-Rico and Olcay gained their fourth consecutive victory by a score of 8-6. Taylor and Watson continued their unbeaten spring, moving to 8-0 with an 8-7 at third doubles. In singles, the Eagles grabbed three straight wins. Gonzalez-Rico won two sets 6-3, 6-3. Cartledge rebounded after dropping the first set to win 3-6, 6-1, 6-2. Fatemi never looked back and gained her 11th-straight win, blanking her opponent 6-0, 6-0. Lopez lost the first set but claimed the second and third set 3-6, 6-3, 6-3, and Olcay won 6-4, 3-6, 6-4. Krtickova praised the team’s efforts over the break and credited their success to their energy. For her performance, Gonzales-Rico was named the UAA Women’s Tennis Athlete of the Week. After their impressive trip, the Eagles will play two matches against DePauw University (Ind.) and Washington and Lee University (Va.) on March 30. The team will be holding their Senior Day, and Lopez, the lone senior, will be thanked for her contributions during her four years at Emory.